A man has been cleared of taking part in a robbery at a convenience store during which a shopkeeper was stabbed in the throat and head. Imtiaz Ul Haq, 58, suffered serious injuries in the attack at Costcutter in Queensferry, Flintshire, on 8 December. Matthew Whelan, 29, from Mancot, has already pleaded guilty to robbery and attempted murder. 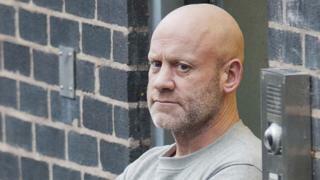 A jury at Mold Crown Court found Leslie Baines, 47, of Connah's Quay, not guilty of robbery on Thursday. The court heard Mr Haq feared he was about to die after Whelan, who was wearing a mask, beat him up and slashed him with a knife. His air pipe was cut and he said he felt as if he was an animal being sacrificed. In police interviews, Mr Haq said he ended up on the floor where he was kicked - but he saw the man's face when his mask moved and he recognised him as a customer. Whelan got away with about £400 from the till. The prosecution alleged Whelan and Mr Baines were "in it together" and were out stealing, just as they had done at Lidl two days before. But Mr Baines told the jury he was simply in the wrong place at the wrong time. He said he had no idea Whelan had a knife and there had been no joint plan to steal or use force. Baines said he dialled 999 - a recording of the call was played to the jury - and he told the victim to put pressure on his wound. He had also not fled the scene but remained there with the police until Mr Haq had been taken away in an ambulance. Whelan will be sentenced in June.